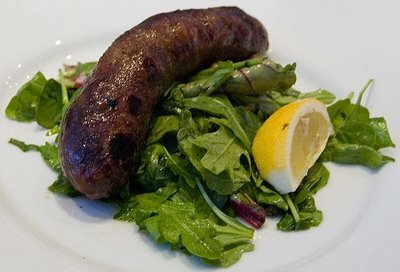 Loukanika (village sausages) are made from selected fresh pork meat, wine, salt and spices. The pork meat is minced, marinated with coriander seeds, black pepper and salt and then left to mature in dry red wine for 7-15 days so that the meat, spices and wine are perfectly blended. Filling the well-washed pork intestines requires skill and patience, a process that is interrupted every 15-20 cm of filled intestine for twisting in order to create the sausage sticks. The filled intestines are then left to dry under the sun for as many days as possible or smoked (Pitsilia Region) in specially designed rooms with fire of apple-wood, pinewood or any other tree of the Cyprus countryside. The whole process takes place for a period of 7-10 days, for 1-2 hours every day. Refrigerated or not, Cyprus loukanika may be kept for long periods and may be consumed fried, baked, grilled, on charcoal or provided they have matured enough, raw as they have been dried from the sun. 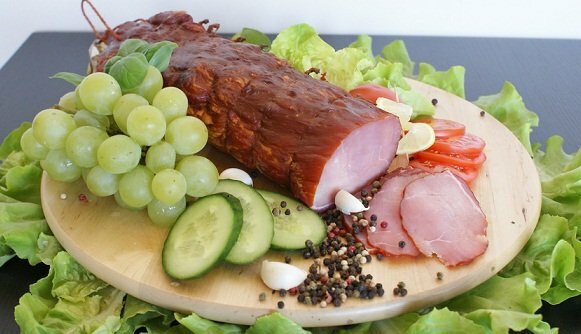 Lountza is made from fresh pork fillet, matured in a mixture of village wine and coriander seeds. The maturity period takes about 15 days and is followed by a smoking process which takes another 20 days. Smoking takes place on a daily basis at a rate of 1-2 hours per day. Traditional smoked Lountza is usually served uncooked, sliced or cubed along with a selection of other meat and cheese delicacies. Due to its processing method, it may be preserved for long periods at ambient temperatures, in relatively cool places without losing its freshness and nutritional value. The processing method also gives a product which is low in total fat content. Hiromeri has been mentioned as early as 1738 by traveller Richard Pococke who noted that Christian people from places other than Cyprus were buying excellent Cyprus hiromeri, produced in a unique way that involved salting and washing in wine followed by hanging and drying (the process of smoking has possibly been omitted). Hiromeri is made from smoked pork thighs which have been cleared from fat. It matures in salted wine for 20 days and is then pressed for two days and smoked for three months. Hiromeri needs to be checked thoroughly during the manufacturing procedure in order to ensure it remains free from harmful microbes and occasionally pressed to remove any trapped moisture. It is a truly traditional Cyprus appetizer with a piquant taste and a perfect snack with many drinks (wine, beer, zivania) regarded by many as the leading traditional processed meat product. ‘Hiromeri’ is suitable for long storage in moderately cool temperatures outside the fridge. 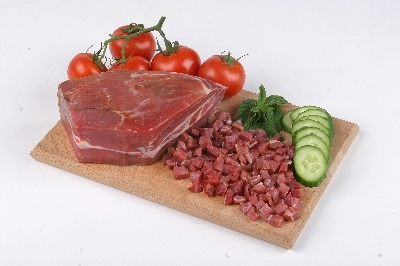 Posirti-bacon is made of pork chest. It matures in salted wine for 10 days and then smoked over burning wood for another 20 days at a rate of 2-3 times daily. 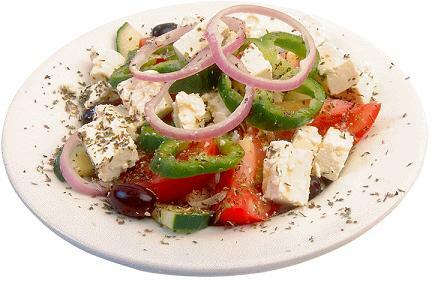 When served it is normally cut into cubes and served fried, grilled or cold sprinkled over with Cyprus dry oregano. Zalatina is made of meat taken from various pork parts but mainly the head and legs. The meat is washed thoroughly and boiled in salted water. After de-boning, the meat is cut into very small pieces while the boiled water is filtered in order to remove the fat and then blended with citrus juice and vinegar. The end juice is boiled again along with the sliced meat and scented with fresh Cyprus rosemary. The final product is poured into bowls and left to cool down in the fridge. Zalatina is usually served as a traditional starter. Apokti is made from goat meat that is taken from young animals under the age of two years. Once the animal is slaughtered, the entrails and the head are removed. The meat is then washed and salted before it is left to dry naturally under the sun. When fully dried, it is cut into small pieces, washed with water and fried in moderate temperature with the addition of mint. It is served with vegetables. 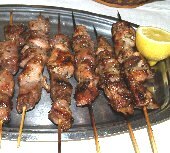 Tsamarella is made by de-boned goat’s meat which is cut initially in large pieces, salted and then left to dry in the sun. Once dried, it is then washed and sprinkled with dry oregano whose antibacterial action acts as a natural preserving agent and at the same time gives the meat an extremely tasty flavor. It is served in the same way as hiromeri.